I’ve been producing blog content for years. I’ve written hundreds of articles on a variety of topics. I’ve written about cars. I’ve reviewed technology and shared thoughts on travel and tourism. I’ve written tutorials and how-to articles for dozens of different products. I can write a great blog post on almost any subject and have it do well with both readers and search bots. I’ve never had a need to analyse my technique and even less reason to change it. I didn’t need to. The vast majority of my writing had always been for-hire. As long as the client was happy with the work, I was happy with the work. Most of that content targeted a specific audience. My natural writing style was a good fit, so I never had a need to alter my technique. Now I want to do more writing for myself. I want to grow my own personal brand and publish my content online. I spent some time researching best writing practices for online content, and am I impressed with what I found. I just discovered the Hemingway Editor, and I’m thrilled. This is the absolute best tool I’ve found for producing blog content. And I’ve only used the free web-based app. I can’t wait to get the full desktop editor installed on my computer. It’s helped me realize that my natural writing style needs to change if I was to succeed. My new audience has a much wider demographic. In fact, it’s an unlimited demographic, because I have no idea who will read the content I produce. This means I need to appeal to the lowest common denominator. By no means is that a derogatory comment. I expect that many of my readers will not be native English speakers, and they’re an important group of potential consumers. I want to ensure my content is easily readable for everyone. My natural style rates at about a grade 15 level on Hemingway. I tend to use longer sentences and more complicated phrasing. While suitable for those accustomed to English, I needed to bring that level down to widen my reach. The Hemingway Editor makes this a breeze. In real time, as I am typing this article, it’s rating my style and offering suggestions. I am hovering at a solid grade 5 level. I don’t want to pass grade 6 for general information. That’s the sweet spot. If I’m writing something more technical, I can target a grade 8 or 9 level which will be more suitable for that audience. There’s also a real-time running word count for easy reference if you’re aiming for a target. I’m learning how to write with shorter sentences. If the text highlight turns yellow, it’s not critical, but I need to get to a period soon. I’m OK with a couple of yellow sentences, and so is the editor. When something I typed pops up with purple highlighting, I know I need to find a simpler way to say it. This is one of the best features of the Hemingway Editor. No only does it highlight complicated phrases, but it gives you suggestions for alternatives. It’s incredibly powerful. Blue and green highlights are less of a concern for me. I don’t use a lot of adverbs, so there are few blue flags. Green flags show a passive voice, telling me I should find a better way to phrase that sentence. Active voice makes for a more engaging read. This real-time analysis is the best part about this editor. I could knock out a usual piece of content in Word, dump it into Hemingway Editor, and edit to a lower grade level. The problem with that approach is too much editing can ruin the flow of the article. Hitting all the metrics is wonderful, but if the article doesn’t flow, no one will enjoy reading it. I’ve found that typing directly into the editor is the best approach for me. If part of my prose gets flagged, I can immediately analyse the words and correct on the fly. This allows me to keep the article flowing. In the short time I’ve been using the Hemingway Editor, it’s improved my ability to write for the masses. I’m eager to start using it for some of my client work as well. 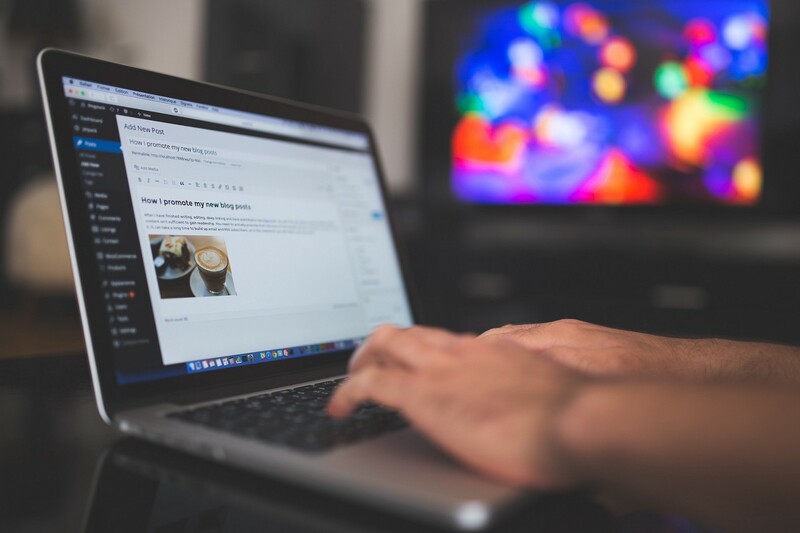 As long as you’re a skilled enough writer that can adapt your style, this tool will help you zero your article right into what your client wants. Certain publications have different accepted reading levels. I won’t get into the mountains of data in this article. A quick search of ‘readability’ will give you plenty of data on the averages. So if you’re writing a general blog, a newspaper, a novel or an academic paper, you can use the Hemingway editor to make sure your content is on point. There are other options for analyzing readability. The most popular is the Flesch-Kincaid index. I’ve used it. The popular Yoast SEO plugin for WordPress includes this analysis. 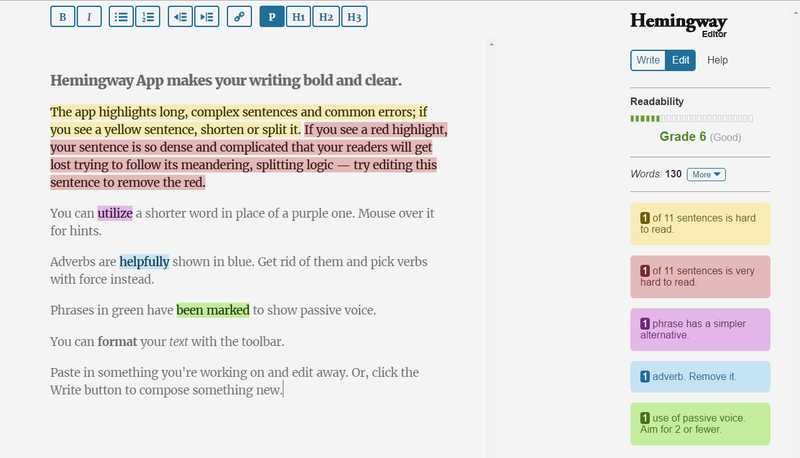 It’s a great tool, but it lacks the real-time highlighting of Hemingway Editor. There may be a real-time Flesch-Kincaid editor available, but I haven’t found it. Please leave a comment below if you know if one exists. I would love to do a comparison. Until then, every piece of content I produce will be with the help of the Hemingway Editor. It’s the most powerful tool I’ve ever found for producing blog content ideally suited for my target audience.